Facts and information about the History of Clothing of Native American Indians and the introduction of Trade Cloth. 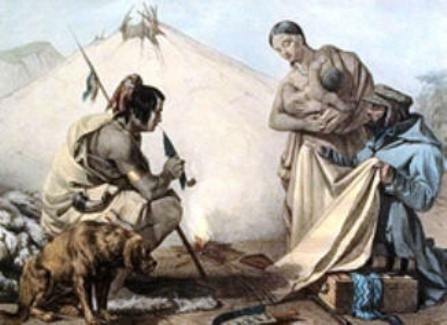 Trade Cloth was first introduced to Native Americans during the late 1700's. Trading posts were established across the country and European textiles were traded for furs and animal skins. The introduction of trade cloth was an important factor in the decline of the lifestyle and culture of Native Americans. Making clothes from buffalo hides or deerskin was a long and difficult process. Trade Cloth became a highly desirable commodity as it was much easier to cut and sew. This article contains facts and information about the introduction of Trade Cloth. The history of traditional or ceremonial dress and regalia worn by Native American Indians is a fascinating subject. The following fact sheet contains interesting facts and information on Trade Cloth. Trade Cloth was first introduced to Native Americans during the late 1700's however, some Native Americans in the Southwest had grown cotton from very ancient times. Before the arrival of the first Europeans, Southwestern tribes such as the Hopi had developed different methods of weaving and wove the cotton into cloth. Trade Cloth Fact 1: Trade Cloth consisted of many different types of machine-made textiles that were produced in vast quantities. Trade Cloth Fact 6: Broadcloth was a product that was originally made as trade wool and used as a trading item with Native American Indians. Trade Cloth Fact 8: The cloths were dyed after weaving. The edge or border of the Broadcloth was usually left white producing stripes of un-dyed sections. These stripes economised on the amount of dye required and were cut away or hidden in the seams of most European clothing. However, the stripes became a desirable feature to the Native American Indians who used the stripes as a design feature in their clothing. Trade Cloth Fact 13: As time passed broadcloth became easily and readily available. Many Native Indian tribes were greatly influenced by the European style of dress and the easy availability of trade cloth. Trade Cloth Fact 14: The Southeastern Native Americans, notably the Five Civilised Tribes, including the Cherokee, Creek and Seminoles adopted western style clothing.